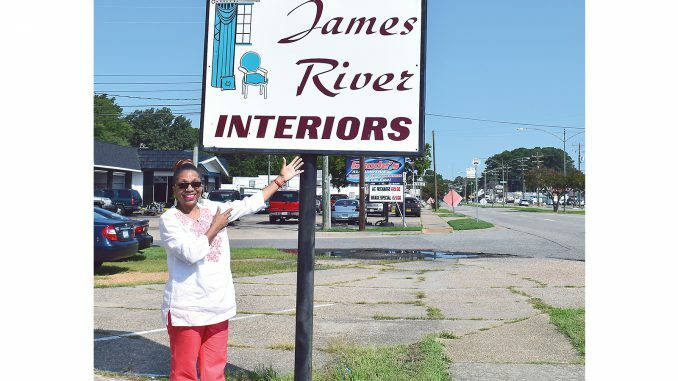 “I have reinvented myself several times,” says Francine Douglas, owner/manager of James River Interiors in the Hilton area of Newport News. She has survived a storm sewer overflow, a business downturn after 9-11 and necessary/unplanned relocations. She has been in business for 20 years and in her present location since 2016. “My customers and church friends have stayed with me,” she says. 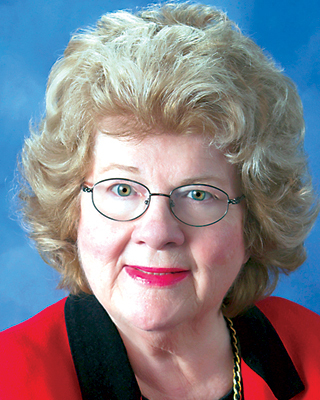 Her perseverance and natural talent have resulted in a nomination for Retailer of the Year. Douglas is currently located in a former home on Warwick Boulevard. “We have added on to the building and repurposed the rooms,” she says. Countless rolls of slipcover and drapery fabrics—beautiful colors and rich textures—line the walls. “Customers may come to my business or I can go to their homes,” she says. Online ordering is also available. Douglas originally operated the business from her home. “I made bridal gowns and helped with weddings for those on a low budget. “I did a lot of free work,” she says. Aware of her sewing ability, her church pastor approached her about helping with a renovation project. “I had never done anything like that, but the pastor had confidence in me. So, I did wall papering and other interior decorations. I covered 900 theater chairs. After two years, I was burned out,” she adds. Along the way, Douglas received several fascinating job requests. “In 2007, I made a special seat cover for Laura Bush when she came to the Shipyard for a christening,” she says. In 2014, she made 1,000 covers for the christening of the carrier Gerald Ford. Douglas has two employees and three students who are learning her craft. She is a participant and advocate for the Student Training and Enrichment Program sponsored and funded by the City of Newport News. It is a summer program for students 16 to 24 years old and involving 70 businesses. “Young people need work. They need help with life skills. I encourage them to believe in themselves,” says Douglas. Along with business skills, the students are learning about upholstering. “Some skills are basic. For one thing, they must learn to show up!” she says. Many of Douglas’s customers are repeat business and referrals. “This is a volatile business,” says Douglas. “I have gone weeks without customers. During those times I develop ideas and work on creativity.” Services include window treatments, blinds, shades and shutters. The National Fire Protection Association has certified Douglas to fireproof curtains. Douglas grew up in downtown Newport News. “I would like to do something to benefit that community,” she says. She owns a building there and is considering opening an upholstery school. In her free time, Douglas researches health issues. She is active in her church, working with children and new members. She is a licensed minister and teaches Bible classes. “Even though I am a ‘people person,’ I do enjoy quiet time at home,” she says. “I like to watch the sunrise at Huntington Beach. I enjoy customizing my wardrobe. Last year I redecorated my own house, using Habitat for Humanity items. And I own an old Harley police motorcycle.” She met her husband at a wedding. They have been married for 30 years and have two sons and four grandchildren. “My husband is retired now and does all the cooking,” she adds with a smile. Douglas enjoys having a movie night with her sisters. Her favorite travel destination is Washington, D.C., where she enjoys the museums. Her bucket list includes visiting Zimbabwe and Paris. Douglas never had formal training. “I learned to sew in the seventh grade in Home Economics class,” she says. “If I ever give up my business, I think I would like to be a nutrition coach.” Today, though, Douglas is ready to help her next customer. “The van is ready to go. I’m waiting for that call,” she says.